Shield for the Heart - In his memoir "Nightmare on Iwo", Patrick Caruso describes how his life was saved during the battle for Iwo Jima by the Bible he carried - it, and the steel shaving mirror he used as a bookmark, stopped a shell fragment that would have gone through his heart. Perhaps this is a metaphor for the role the Bible can play in our lives - when times are tough, when illness or circumstance strike at our heart, the Bible, with its marvelous stories of faith and its message of supreme hope, can be our shield. If we will but let it. Stephen Ambrose's wonderful study of Easy Company (of the 506th PIR, 101st Airborne Div.) launched a great HBO series, and a number of follow-on books that illuminate the experiences of some of the individual members of E Co. Beyond the bonds that grew between the men, these books show the hope and decency of the Americans who were part of our 'Greatest Generation". Many of these men are gone now, but their voices, and stories have been preserved...we are so fortunate to have them. Stephen Ambrose highlighted Easy Co., but the stories extend to the experiences of every American who fought in the Second World War. We are blessed to live in a world that these men made safe for us...there are so few left. When you see a WW2 veteran, thank him. He deserves it...and you owe it to him. And please, read the stories they have left for us. 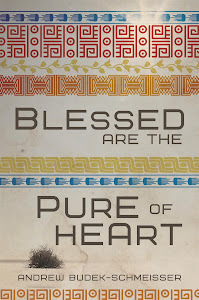 Hi - I'm Andrew Budek-Schmeisser, author of the novel "Blessed Are The Pure Of Heart", which will be released by Tate Publishing on July 10, 2012. It's the story of Scott Everton, a Marine Viet Nam veteran who's drawn away from life...until the supernatural, in the form of a Warrior Angel, breaks into his isolated world and offers him a new chance at life...and love. Scott risked his life in Viet Nam, but to step out into this new world he has to risk even more...he has to risk his heart. In the future we'll explore faith and writing...and some other stuff, too!